The U.S. wind industry is about to lose its federal subsidies. That will bring benefits, according to Vestas U.S. chief Chris Brown. Denmark's Vestas operates a number of factories in the U.S., its biggest market globally. As the Production Tax Credit winds down, along with the last opportunity to safe-harbor wind turbines at 40 percent in 2019, wind development is now poised for its next phase of growth. This growth will look different than what we are used to. A new mix of factors — some familiar, others more nascent — will determine the value of wind energy without the tax equity subsidy. Project developers will need to create a new formula to calculate costs and value in a post-PTC environment. Some might be surprised at how the economics add up to a new phase of growth for the industry. The PTC, passed on a bipartisan basis in 2015, provided a clear regulatory and incentive structure that enabled a crucial maturation phase for wind energy in the U.S. We achieved significant cost reductions — 70 percent since 2009 — with economies of scale, better technology and better data management. Wind is now competitive with every type of generation resource on an even playing field. This was a courageous step for the wind industry, to voluntarily phase out its core policy support. It’s a step that much older forms of energy still haven’t taken. Now the cost equation will change again. However, it won’t be the "cliff" that some have been predicting. The new and simpler cost equation will have four primary factors that developers today will be focusing on for expansion in 2020 and beyond. Technological efficiencies, development concerns and operational efficiencies have well-understood and well-documented trajectories that have allowed power-purchase agreement (PPA) prices to continue to decline over the past three years. However, there’s still more juice to squeeze there. Most significantly, the end of the PTC will trigger an expansion of the customer base and reduction of the cost of capital. That will open a new phase in the development of wind energy as a mainstream power source for America. Technological innovation has driven most of the cost reductions over the last 10 years. Today’s 4+ MW wind turbines tower over the 600 kW machines of the last decade, providing more power from a comparable footprint. Some gains are reaching the point of diminishing returns, but others are opening up. The next phase of innovation in wind energy technology is modular efficiency and customization. Modularization will allow manufacturers to create further cost savings for customers either through PPA prices or levelized cost of energy (LCOE). Using the same components across wind turbine product ranges allows developers to deliver higher-quality systems, reduce maintenance costs, and fully optimize wind systems to local conditions. There are some limitations to continued cost reductions, and the wind industry will need to continue to innovate our processes for siting, permitting and grid connection. 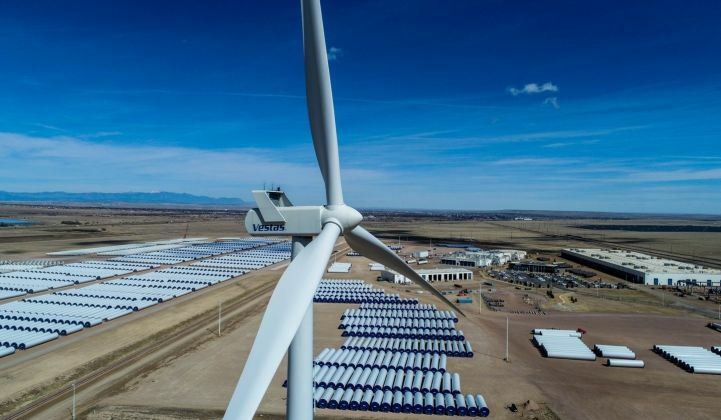 In the U.S., many of the most ideal sites with the best wind resources, grid connections and social acceptance have been developed. The industry’s geographic growth will necessarily occur in locations that provide additional development challenges, often creating additional costs. As developers explore new territory, they will encounter different social license challenges. New England wind farms have had much different receptions than Midwest developments, and it will be different again in the Southeast. It will behoove project developers to continue to advance the way that they introduce new projects to communities, using digital tools to supplement grassroots and grasstops organizing for community acceptance. Transmission availability and congestion also remain a challenge. More sophisticated technologies such as high-voltage direct current (HVDC) allow greater distances between generation and demand, as well as repowering existing lines. Hybrid projects that include co-located wind, solar and/or storage can be managed with sophisticated software to provide new ways to deal with congestion on transmission and different approaches to achieving profit by shifting supply to higher demand periods. As the technology evolves to solve these issues, power markets must evolve in how they value and prioritize a variety of resources on a real-time basis. With over 56,800 wind turbines now spinning across the U.S., project operations and maintenance (O&M) has become a highly sophisticated endeavor, allowing project developers and operators to offer more accurate power output forecasts. Some new efficiencies are being found through centralization of monitoring, others through increasingly sophisticated data analytics and predictive maintenance optimization. The shift to drone-based and IOT-sensor inspections will continue to yield benefits. The biggest efficiencies to be found in O&M are the efficiencies of scale. The more turbines a company has under supervision, the larger a database it has to draw from in order to make predictions and assumptions. Finally, manufacturers are getting more innovative in their service offerings. O&M can now be wrapped into the equipment sales contract, enabling capital investment discounts and allowing the developer to shape their costs over the duration of the project’s life span. This portion of the cost case is the most promising aspect of the new cost equation. This is how the end of the PTC can open new horizons for the industry. Wind is already a critical part of utilities’ resource portfolios and the energy investment portfolio of institutional investors and Fortune 500 companies. But under the PTC regulations, a limited number of companies have the ability to engage in development. The cost of tax equity is higher than regular debt, and many organizations have found that they had insufficient volume and appetite for it. By removing the PTC entirely, many new investors will find an appetite for wind projects, diversifying the sources of capital that project developers can draw on. A broader base of investors will mean more competition for quality wind investment opportunities, and will contribute to wider availability and a lower cost of capital for project developers. We’ve quantified the benefits. The value of the 40 percent wind PTC in 2023, with turbines safe-harbored in 2019, is roughly $7 per megawatt-hour on a project with a 30-year lifetime and a 7.5 percent weighted average cost of capital (WACC). By shedding the cost of tax equity, that same project completed one year later, with no PTC will have a WACC of 4.5 percent, covering $4 per megawatt-hour of the 40 percent to 0 percent PTC spread. With improved technology, supply chain and service on a year-over-year basis, a company like Vestas can recover another $2.50 per megawatt-hour. The difference in wind LCOE between 2023 and 2024 will be marginal with the wind industry running 100 percent subsidy-free. Wind developers can continue to buy turbines and plan new projects in 2020, confident they will be able to continue to provide competitive energy resources in 2024 and beyond. This is the beginning of something the U.S. energy sector has never seen before: a generation technology that is reliably profitable without federal subsidies of any kind. Chris Brown is Vestas' president of sales and service division in the U.S. and Canada. Vestas was the world's leading supplier of wind turbines in 2018, according to Wood Mackenzie Power & Renewables.